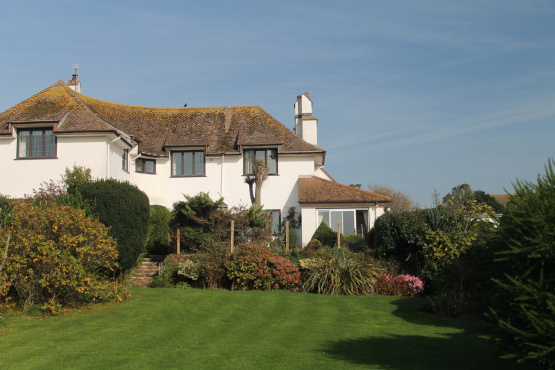 Glen Lyon is a superb 'Arts & Crafts' period, 3 bedroom property with garage, situated in a quiet, tucked away location in the popular coastal village of Thurlestone. The Arts and Crafts movement was an international design movement that flourished between 1880 and 1910 continuing its influence until the 1930s. Typical features of such properties may include asymmetric lines, handmade wooden characteristics and white, roughcast render with the intention of exposing the beauty of natural materials. 3b Landpath otherwise known as Glen Lyon, is a semi-detached property of such a period, that sits on high ground facing south affording wonderful sea views. The current owner has been in residence some 30 years and has retained a number of beautiful aspects in the property including an oversized stone fireplace that has been fitted with a wood burning stove and an oak panelled staircase rising to the first floor. A sun-room accessed via the sitting room has been added recently to the side of the property providing a pleasant area to sit and look out, there is also an adjacent study or guest room. All bedrooms offer charming aspects out over Thurlestone with particularly long views from Bedroom 1 and Bedroom 2. Glen Lyon is a spacious property with an abundance of practical accommodation but also a property steeped in history and design interest.